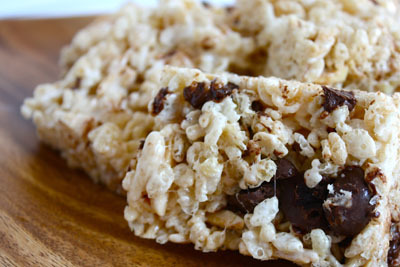 Rice Krispie treats are a fast and easy sweet snack to make. I remember making them as a child, and just this morning saw a commercial with a father and son making Rice Krispies together on a rainy day. Rice Krispie treats are as ingrained in the American culture as baseball. Never one to blindly follow as recipe, I wanted to give my krispie treats a little oomph. I had some Cherry Raisinets in the pantry, which I had used to make Cherries Jubilee Ice Cream. The dark chocolate covered, chewy dried cherries would be very nice in a rice krispie. But I wanted more oomph. Nuts maybe? Yes! Toasted nuts? Yes! Toast the nuts in browned butter? Oh Yes! 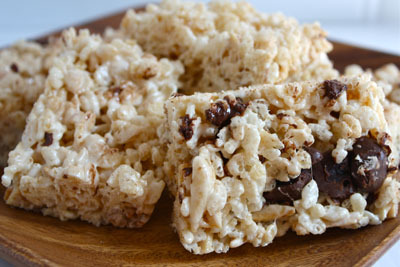 I’ve nicknamed these rice krispies treats Krack Krispies, because I could not stop eating them! I was picking at them as I was trying to take a photo! They are that good. I managed to stop myself long enough to get off a few shots, and them stood next to my mini photo studio (my living room window) and ate even more of these krack krispies. In a large saucepan over medium low heat, melt the butter. 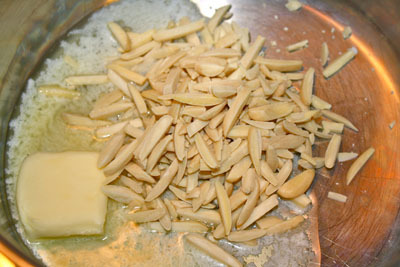 Add the almonds, and watching carefully, let the almonds and butter brown. 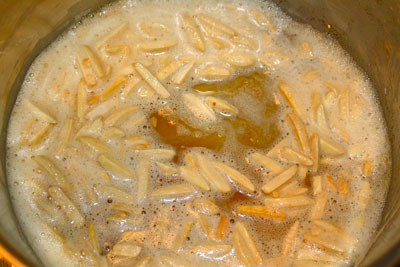 Stir the almonds occasionally as they brown to insure even browning. When the almonds and butter are light golden brown they are done. 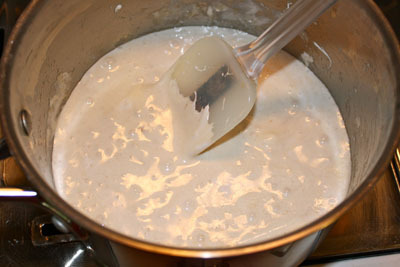 Add the marshmallows to the saucepan, and stirring continually, melt the marshmallows until smooth. Remove the sauce pan from the heat. Place the Rice Krispies into a large bowl. Pour the melted marshmallow over the cereal. If you have nonstick silicone spatulas use them to mix. 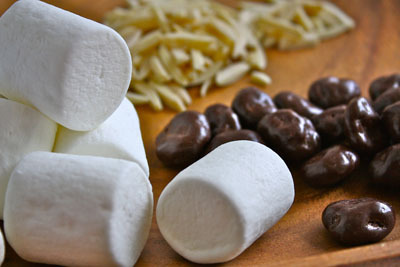 If not, butter a large spoon and mix the cereal and marshmallow until well coated. 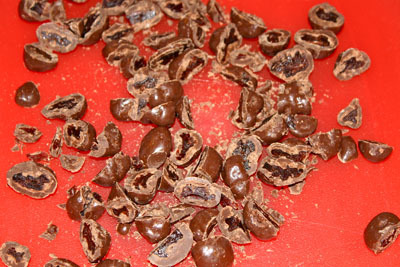 Add the chopped Cherry Raisinets and mix quickly so the chocolate does not melt too much. 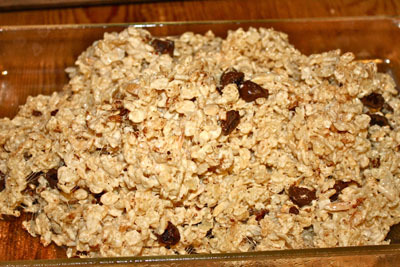 Scrape the treats into a 13 X 9 X 2 pan that has been buttered or sprayed with nonstick cooking spray. Press the Krack Krispies into the pan to make an even layer. Let them cool completely before cutting in squares. Now try to eat just one. Krack krispies! No matter how they come, rice krispie treats are always good.